Can a referee change his mind and take back a card he issued a player? Can a referee take a back a card he has issued a player in the game of football? 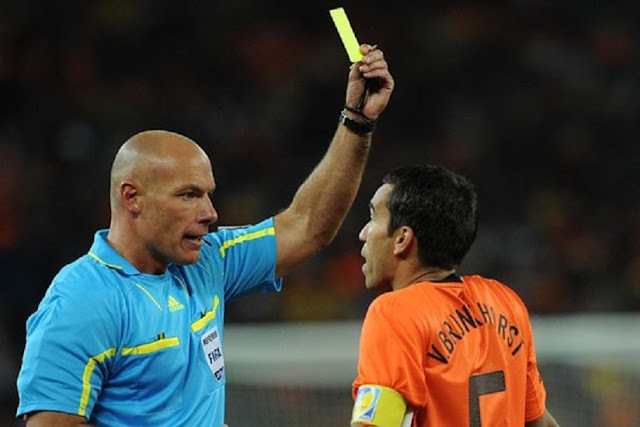 Though rare, it is possible for a referee to change his decision about a card he has shown. He may change a red card to either caution (and show the yellow card) or decide to send off a player (change a yellow card to red), but only if the game has not been restarted again. "The referee may only change a decision on realizing that it is incorrect or, at his discretion, on the advice of an assistant referee or the fourth official, provided that he has not restarted play or terminated the match." The referee would usually consult his assistant referees regarding this decision, to ascertain what they witnessed. The referee may not consult or take into account any input from any other person other than his assistants. It is unethical for a referee to allow players to convince him to change such a decision. However, players usually surround referees in order to intimidate him or somehow 'guilt' him into believing that he was unjust to the carded player. This is usually effective, as the referee is only human, and would somehow even it out by ignoring another card-worthy foul later on or by being consistent by carding the other team for a similar offense. Referees who change their decisions based on protests, information or any other input from a player or anyone other than an assigned official, are removed from refereeing when authorities review the event. Referees have occasionally changed decisions (including cautions or send-offs) based on player protests, and have later been removed from refereeing. The principle behind such removal is that a referee must be absolutely impartial, not subject to influence by either side. Allowing either side to influence a decision compromises the referee's integrity.